This recipe is from my childhood. I was fortunate to have a dad that cooked and this was back in the ’70s when men cooking wasn’t cool. My dad had a full-time job and my mom worked part time. She had a number of jobs over the years when we were kids – waitress, cleaning houses and lunch lady at our school (embarrassing!). Dad had a full-time, 9-5 as an HR/Operations guy for a manufacturing company so mom only worked a few evenings and weekends. There are five of us – four girls and one boy – all born within ten years and dad was a whiz at coming up with meals that we wouldn’t turn our noses up at and that he could put on the table pretty quickly. He also liked to experiment in the kitchen. 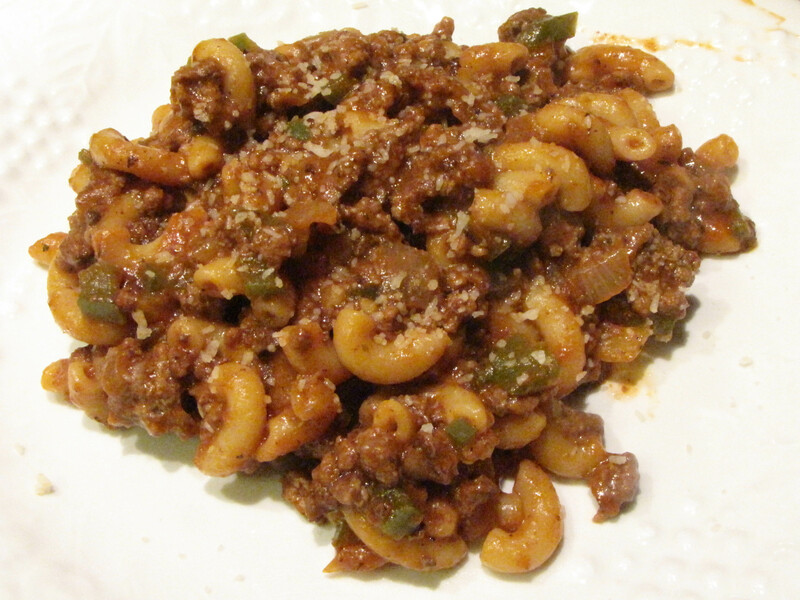 One day when he was making a batch of beef-a-roni, or goulash as some call it, he decided to add red wine. We kids thought that was just scandalous! Dad was adding WINE to the beef-a-roni. Mom doesn’t do that! Can we even have wine? Dad assured us it was just fine and dubbed the meal, Beef Booze-A-Roni. You can imagine how much fun we kids had with that! In a large pot of salted water, cook the elbow macaroni to al dente. Be careful not to overcook. 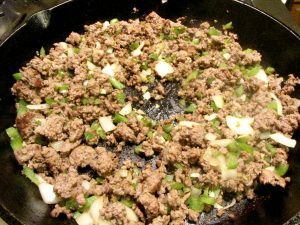 Place a large skillet over medium high heat and add the ground beef. Once it’s good and brown, add the bell pepper, onion and garlic. If the skillet is a little dry, go ahead and add a little olive oil. If there’s a lot of grease, drain it. 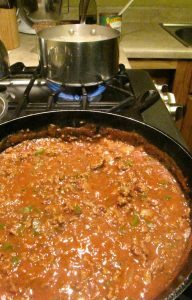 Once the peppers and onion are a little tender and the beef is nice and caramelized, add the wine to deglaze the pan. Stir constantly and let the wine evaporate. Add the tomato sauce, water, Italian seasoning, salt and cayenne pepper. Reduce the heat to a low simmer. 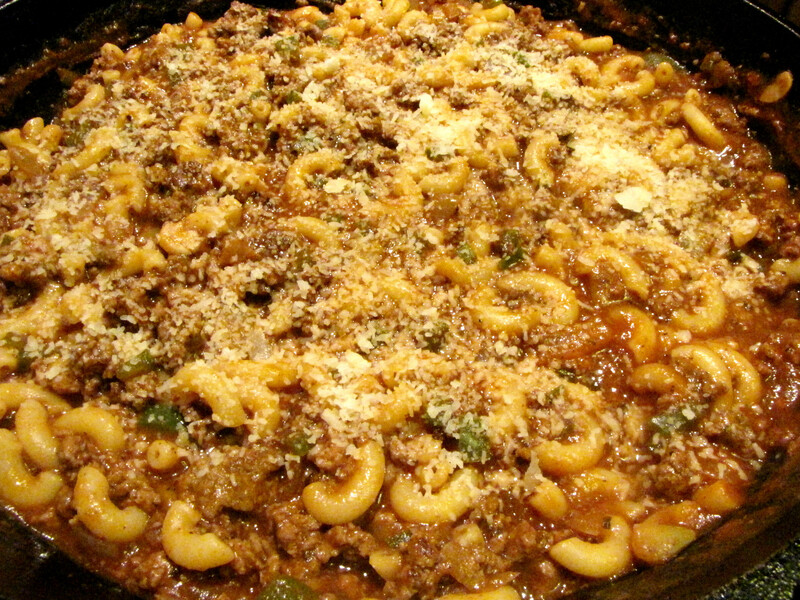 Once the macaroni is cooked, add to the meat mixture. Add the parmesan. Simmering in the pan. Smells so good. Stir and let cook for another 10 minutes. Taste and adjust seasoning to suit your taste. Let simmer another 5-10 minutes. Serve with more cheese. Get the meat good and brown. Don’t worry about letting the onions and peppers cook too much at this point because you will simmer the dish. I hope you and your family enjoy it as much as my family still does. Comfort food at its best. Easy, one-skillet dinner - beef-a-roni - classed up with a little wine. In a large pot of salted water, cook the elbow macaroni to al dente. Be careful not to overcook. Place a large skillet over medium high heat and add the ground beef. Once it's good and brown, add the bell pepper, onion and garlic. If the skillet is a little dry, go ahead and add a little olive oil. If there's a lot of grease, drain it. 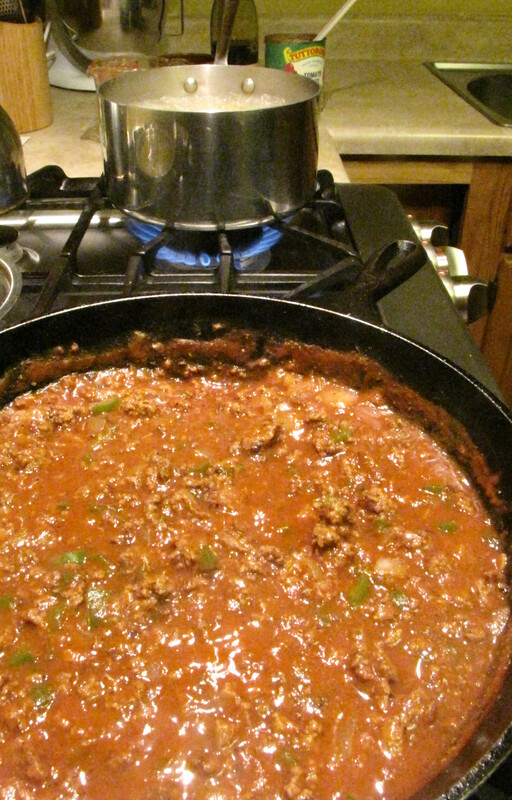 Once the peppers and onion are a little tender and the beef is nice and caramelized, add the wine to deglaze the pan. Stir constantly and let the wine evaporate.